Few months ago, Xavier invited me for a private session of a project he was planning to start. The moment I saw the first images I got sold. This is going to be big, I thought. Now it is time to share it with more people. In fact, more than just know about the project, you can help it to be produced. Take a cup/glass of your favorite drink and enjoy the interview. I come from an industrial design background, but since my youth, movies, novels and comics, video gaming, and paper role-playing game have driven me to the interactive and video gaming world. Now, I try to drive my passion more in trans medias projects, crossing several medias and platforms through one universe. I had been involved and released up to 26 games on mobiles, consoles with big names like Atari, Microïds, Gameloft, Disney and Sarbakan. You are not new to Kwik’s world. Your first app, “Halloween Recreation”, was even awarded as App of the Week from Corona Labs followers. How did you find Kwik and how was the experience learning/using it? a) The first one is that Kwik+Corona offer a cross platform deployment solution. You don’t have to code again too many elements, if you planned/designed them well. This simplifies your porting. b) The second factor that really appealed me was that you don’t have to export your assets all the time, when working on a project. In all other engines, when working in Photoshop, you must save your asset files, and then you have to import and format them in the game engine. In Kwik, it is not necessary because it gets all these aspects directly from the compositions. If, like me, you use smart objects in Photoshop for many or all of your layers, you can nearly edit any asset, at any step of the process. Even is you change too much your visuals, editing some of your scripting is still lighter then comparable solutions. Your next project, Near Humanity, seems to be one of the coolest things I have seen. What is about and how is the development at this moment? Thank you at first for your great comment. Your comment is the reward explaining why we are battling now to make Near Humanity gets funded. 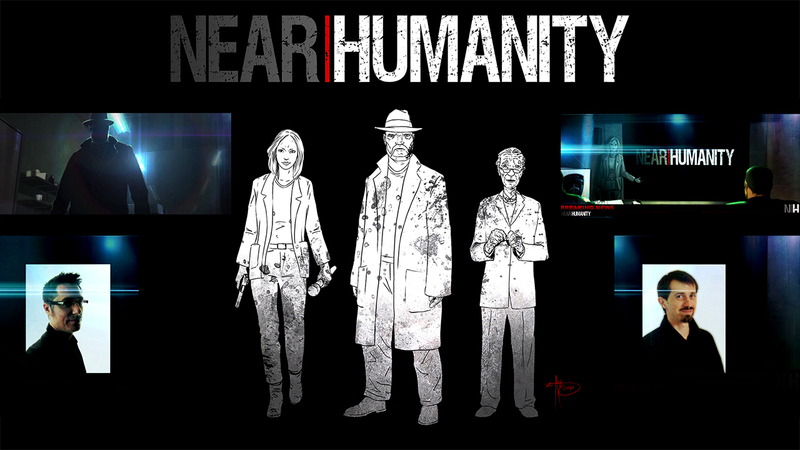 Near Humanity is a collaborative work with Emmanuel Beaudry, the co-director on the project with me. I had in mind to start as soon as possible a project for a mature audience. I went in a comics forum and found an initial pitch from Emmanuel. It had this classical touch for a horror story in an historical context, which we kept till now, but the original pitch has expanded to explore our universe in several periods of history and adding new characters to the cast. Secondly, I do believe the market is also ready to explore mature and adult content on handled devices. I’m totally fan of cute and colorful games, comics, as seen in my first project. Emmanuel and I are also passionate about horror projects with an intelligent approach. Near Humanity have these classical touches, dark and gritty emotions, elements that remind you of movies, comics and other references. Again, I feel that our approach is to play with history and some of its darkest days, twisting them along our mind and point of views. The project at this time is moving on, but with a slowdown, as we spend more time now to promoting, building our audience, and more, raising the funds to produce it. We spent time in production and development, having funded everything ourselves. Now it is time to gather funds from contributors, if we want to explore, develop the full series of 12 episodes, featuring between 5 to 7 minutes per episode. We want this project to be an “Indie series”, especially after such positive feedback like “Near Humanity looks gorgeous like some blockbusters”. We plan to go further and keep the quality, but all of these aspects have costs to be covered. You mentioned the story is going to be divided into several motion-video episodes. What are you planning for the app interactions? Anything you can share for now? At this step of development, we won’t unveiled precise and accurate details about how we’ll divide each episodes, but we decided these multi-segments from exchanges with partners, making screen testing with some testers to see how they behave, react to the project and to existing products. A motion comic is not a movie, neither it is an animated movie, a video game or a traditional comic. It must be a mix of all these facets. It will help to guarantee readers/players attention and enjoyment all along the story and events. How is your regular day during project times like that? What’s your flow planning, designing and developing your apps? Basically we work on two fronts: the motion comic and the app development. In the first one, we work on the motion comics. We start from the script by Emmanuel. He send me a script, I read it and we exchange. We agree on some ideas, modifications, then we move on an animatic to study what we could have at the end. We analyze the animatic, make changes, and think again on the flow. Then I draw the final illustrations, mixing several medias (photos, scanned sketches, 3D, digital paintings etc…), then I import it into After Effects, where animation happens. Emmanuel then edits everything in Final Cut. All along the process, I prepare the music and the sound design. Emmanuel on his side will get involved with real actors, to drive their performances. Our main flow is really organic. We exchange but, as we are a really small team, we also adapt to both our ideas, and besides, we are both big movies addict, so sometimes when we speak of a scene, we share common influences and inspirations to make it punchy. I do believe also that you can approach deep and hard subjects if you keep in mind to add some wow moments and other “in your face” visuals effects to make the project more commercial and punchier. The second front is concerning the app development. I’m the in charge of this technical aspect. Emmanuel prepares all the text and then we decide together what will get in the app. I then work on the visuals and create a first page, the main menu of our application, to set the tone. Kwik helps me to work fast, to test and see on the tablets if it works. As I did with Halloween Recreation, I make videos, and some testing on several testers devices, to know how they react to the content. Are you planning to fully use Kwik native’s features or external code will be added to the project as well? Any feature you wish it was native from the plugin? Near Humanity is less intensive on development need. We don’t see Near Humanity as a video game in its essence. We are looking more on a way to keep the mood consistent across every Near Humanity representation. The main feature we would be looking for Near Humanity in short term is the plain use of Expansion files for Android, as the app is heavy on visuals and the 50 MB limit in Google’s platform is not enough. We would have to decrease the video quality for Android, which don’t please us. We’ll have interactions, but we want to tell a story at first and make it with several facets. How can people help the development of Near Humanity? People can contribute at first to the project on our Indiegogo page. The contributions will not only help the entire project to be funded but also it reward people with lot of really great perks. The beauty is the more we raise the more people gets. We decided to offer a variety of perks to make it affordable, you can contribute low if you have a limited budget, but you’re welcome and you will belong to our fellowship. People can also help us by promoting our project, share our Facebook page or the link to our Indiegogo page with your contacts. The more people aware of our project, the bigger audience we could gather and higher chances to raise funds. Any tips or final words to Kwik users reading this interview? Copy and paste actions are so great and save you lots of time! Use them enables you to quickly script your app. It help to explore, or within a given time to do more or shorten your coding period. Don’t hesitate to throw away content, change, edit and test your app with other users, and more with your audience. You’re not doing something for you. It’s your stuff, it’s your app, you want to do your best illustration, your best application but, at the end, it is your final audience the one who embrace the experience. At the end, make things with passion. It’s like 20 years I’m in visuals and product development, and I hope to be able to share with a large audience more and more creations, and our last one Near Humanity. All the best to Near Humanity project. We are looking forward to have it in our devices! Again, any small contribution will help the project, as low as 1$, 5$ 10 and more, will help us and cheer us for the work done so far.